Design Parameter: 100% RH, Inlet Temp. 40 deg. C Operating Pr. 16 bar Max. However units for higher-pressure up to 150 bar can also be supplied. 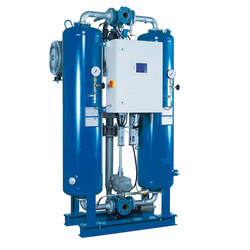 We are instrumental in manufacturing and supplying a wide range of Compressed Air Dryer. Our Manufacturing unit is equipped with all latest technology equipment's for manufacturing Refrigerated Air Dryers. Our range of dryers is available with Tube in shell and tube in tube design, which helps in maintaining the heat transfer efficiency throughout the dryer's life. This range of High pressure refrigerated air dryer is available up to 300 CFM. 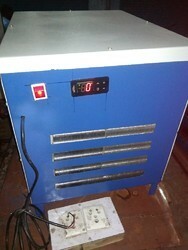 We are provider of Ferranza Refrigeration Air Dryer. Our entity is accomplished to provide Heat Less Type Desiccant Dryers In varied specifications. Our presented products are extremely employed owing to their longer working life. To cater the variegated needs of our esteemed customers, we are highly engaged in offering a wide array of CKD Refrigerated Air Dryer. Having keen market understanding and vast experience in this domain, we are offering the best quality range of Refrigerated Air Dryer. It is manufactured using admirable quality raw material and advanced technology by our specialist. Our product provides dry and clean compressed air necessary for many industrial applications. Owing to the years of industrial experience, we have been able to provide our valued clients with a wide range of Refrigerated Air-Dryer. Our Manufacturing unit is equipped with all latest technology equipment's for manufacturing Refrigerated Air Dryers.